So I built my two Arduinos on a Breadboard, using 3.3v regulators to remain within the RFM12B spec. It was a struggle to work through the jumper wires, but I managed to get the test up and running, and had the two modules communicating. OK, so the principle works, now let’s wire up a few buttons, a temperature sensor, and a few LEDs. I also only had one FTDI board to program the microcontrollers, which I was repeatedly unwiring and rewiring. I now had a mass of jumpers, and couldn’t see the forest for the trees. It was time to re-think things. The first stage of the project was to develop a prototype that could be easily and quickly tested and tweaked. 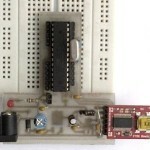 The key focus was to test the footprint of the board, as well as of course the functionality. This was achieved using the toner-transfer method to create the PCB image on a copper-clad board, and then to etch, drill and solder this manually. The first version of the PCB worked well, but of course we picked up a few items to tweak and refine. Once that was done, we were ready to move onto the next step – a two-sided PCB with additional functionality.